Hi! My name is Daisy. I’m around 4 years old. I was found on the side of the road near Calhoun, GA, late one night after being hit by a car. A really nice lady took me to the emergency vet and paid for all my treatment and tried to find my family. I was so scared and I didn’t know what was going on. My head hurt really bad and I couldn’t even walk. The doctor told the nice lady I had radial nerve damage to my right front leg, head trauma, and injury to my right eye but I was going to live. After a week of trying to find my family, the nice lady called SEPRA to help me get better and find me a nice, new family. So now I’m at a foster home with two puggies who are really nice to me. I’m trying to get used to walking without using my leg, but it’s confusing because it’s there, but it just doesn’t work. My foster mom took me to another doctor to get all my shots and she said if my leg doesn’t start working soon, they will have to amputate it. That was SO scary to hear! What will I do without my leg? I’m used to running and playing and doing whatever I want. But my foster mom says if it happens, I will adapt, and I trust her, so I guess I’ll be OK. (But it’s still scary.) I am going to see an eye specialist soon to see if there’s anything they can do about my eye, but I have a feeling I’m going to only have vision in my other eye. It’s a good thing we have 2 eyes! My foster mom also says I’m absolutely the sweetest foster puggy she’s ever had. I follow her everywhere, even though it’s hard for me to walk. I love to sit in her lap and to be held. I can stand up on my back legs and tell her when I want to be picked up. I am very well behaved and perfectly housetrained. Once I’m ready for my new family, I know you’ll just love me! If you’d like to see more pictures of me, you can look at my photo album at http://community.webshots.com/user/penguinpug100. Hi folks! I know you have been wondering about me. Well, my foster mommy took me to my doctor today. My doctor said the good news was that I could keep my eyeball that was damaged from the car accident but that my eye medications would cost around $150.00 a month for the next couple of months. My mommy is a little nervous about all of that money but the nice folks of SEPRA said they thought I would have virtual fosters and that I was worth it. If it wasn’t for them, my eyeball would have had to come out. I can’t imagine how much that would have hurt me. Please, please, please, help the nice folks of SEPRA as a thank you for going above and beyond to help me get well again. WHEW! 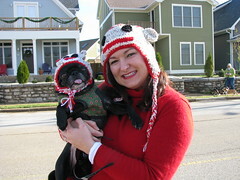 I took a long restful few days after Pugfest 2009! If you were there, you will remember me. I was the one with the loooong tongue, oh, and 3 legs. I think I was in human arms more than I was actually in the foster pen. Every time someone put me back, someone else wanted some kisses. 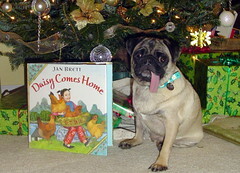 Of course, I found it important to greet everyone properly with many licks. My mom thought I was ready to start my search for my forever family. The doctor that took out my lumps said they were not cancer. He wasn’t sure what they were but could possibly be scar tissue from my accident. He also said I only had to continue my antibiotic eyedrop now. My foster mommy will be so sad to see my leave. She and I love each other very much but she knows that it is very important for me to find a family who can keep me forever. If you think you can provide a warm lap and a loving home, please apply and specify Daisy. Do you love my Christmas picture or what!! My mom is so talented. Of course, it makes it easier when her subject is so beautiful! I’m still here waiting on my forever family. I really hope I can make someone’s Christmas a little brighter this year. I know it would mean a lot to me to find a home that could keep me forever. I am a great little girl who loves attention from other dogs and humans. I run and play as if I had 4 good legs. I play with toys and do all the normal things that puggies do. Please don’t let the 3 legs fool you. I am not handicapped in any way by the loss of my leg. If you a looking for a wonderful Christmas addition, please apply for me.